This is Garza's impression of what the Astros did to him last night. Things don't seem to be going well for the Cubs lately. The Sox came in and swept the first interleague series of the year. Garza got shelled last night. Dempster's looked pretty average lately. LaHair is doing his best impression of Alicia Keys' first single ('Falling'? Anyone remember? God, you stupid kids these days don't appreciate the classics...). But as any gambler will tell you, just because a prostitute on the Vegas strip has a deep voice and a pronounced Adam's Apple doesn't necessarily mean it's a dude, and on a lonely night when you're down $20K, a mouth is still a mouth. Wait, what? Hang on. I lost my train of thought there. Let me try that sentence again. But as any gambler will tell you, luck can come in streaks and turn at any time. Take a look a Dempster last season. In six April starts, his ERA was a whopping 9.58. But if you looked at his underlying stats (BABIP, K/9, etc), mathematically he should have had a much lower ERA. In other words, his terrible April had a lot to do with bad luck. Baseball stat nerds knew he was going to turn things around eventually, and he did, posting a much improved 3.94 ERA the rest of the way. Now some players can ride a good luck streak for an entire season sometimes. Remember Esteban Loaiza? If you played fantasy baseball in 2003 you do. From 1995 to 2002, Loaiza had a career ERA of 4.88. Out of nowhere, he goes 21-9 with a 2.90 ERA and obliterates his career bests in ERA, strikeouts, WHIP...pretty much everything. After 2003? He goes right back to being awful again for the final five seasons of his career. That's just a rare case. Luck doesn't usually run one way or another for an entire season, as the Cubs are beginning to see. I'm not saying that Garza, Dempster and LaHair aren't good players. But they were all performing way over their heads. 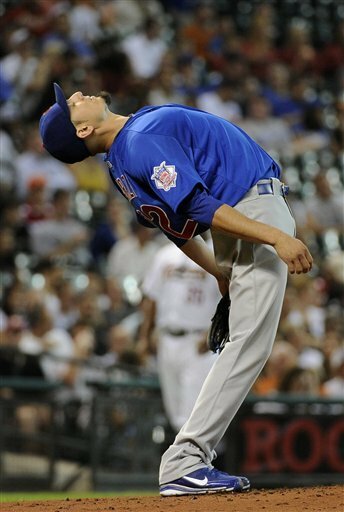 Going into last night, Garza was carrying an ERA of 2.58 when really, he's about a 3.20 - 3.70 ERA pitcher. After last night's molestation at the hands of the Astros, that's exactly where he is now (3.72 ERA). Even after 2 shaky outings, Dempster's ERA is at a cool 2.28. Expect that to end up closer to 4.00 than 3.00 by the time the All-Star break comes around. And LaHair? Well he's certainly no top-10 player. If he can keep his walks up, he'll be solid, but anything more than 25 home runs and a .260 average would shock me. The saddest thing about all this regression hitting at once? Three of the Cubs best players were getting extremely lucky on the field so far this season, and they're still a last place team 12 games under .500. Bust out the Malört, gents. It's going to be a long year. LaHair's slump I blame completely on my apology to him. Had I just continued hating him everything would be fine. That's why I continue to hate Snork.